After working hard and gaining years of experience, you might find yourself getting promoted up the ladder to a senior management position within your firm. Senior management jobs generally include positions within the following groups: Director, Vice President, C-level, and CEO. Depending on the size of the company, and the industry in which it operates, you could find that the same job title has different meanings, different responsibilities, and a very different salary. However, these jobs generally carry a certain level of responsibility in common and have tasks relevant to the position's title. A director is a senior management position responsible for the strategic and tactical management of a significant piece of the company. Directors typically manage a few subordinate managers. Within their area of responsibility, they generally have wide latitude, with an expectation to meet broad goals. Normally they have responsibility for managing the profit and loss of their group or division and have hiring authority within their budget. Some larger organizations may have associate director or assistant director jobs. The individuals in such positions usually assist another director in managing his area. However, the title can also be used for someone with director-level responsibility, but for a smaller part of the organization or someone whose lack of experience or seniority in the company doesn't justify the higher title. The Senior Director title may be assigned to an individual responsible for a larger part of the organization. It also may be assigned to someone who has been on the job longer. Many large organizations also use the managing director title. This individual manages a substantial part of the organization. This person manages a group of other managers and/or directors. The managing director may be responsible for managing an entire region, a function across all regions, or a specific business unit. In a few organizations, like consulting firms where the director title is used by all management levels, managing directors have the responsibility not only to oversee teams and direct work efforts on client engagements but to also bring in new clients to the firm. Some larger organizations may have multiple vice presidents as described below and some very large organizations may have a level of executives above the vice president level. These are referred to as C-level positions. Some organizations, especially in the banking and commercial real estate industries, may have associate vice president or assistant vice president titles. The individuals in these positions usually assist another vice president. However, the title can also be used for a more junior individual. The Senior Vice President title can be assigned to an individual who has responsibility for a larger part of the organization. However, it has become more commonplace for individuals at this management level to have titles such as Group Vice President, Division Vice President, Area or Region Vice President, or Executive Vice President that denote that individual’s area of responsibility. 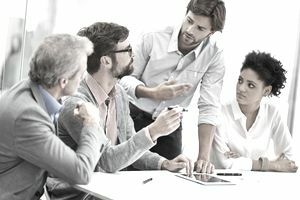 In the largest organizations or ones that choose to emulate them, a management level exists for personnel with so-called C-level executive titles. These include CAO, COO, CFO, CTO, and many newer variations. The initial C in each of these titles stands for "chief," and it's where C-level gets its name. The CAO acronym stands for Chief Accounting Officer, the COO is the Chief Operating Officer, CFO is the Chief Financial Officer, and CTO is the Chief Technology Officer. Other titles at this management level can include Chief Marketing Officer, Chief Information Officer, Chief Sales Officer, and Chief Customer Officer, among others. Technically, the CEO is part of this group but has a higher level of responsibility. The individual in a C-level job has achieved the highest executive level in that company for that functional area. All the other executives in that functional area report to the C-level executive. For example, all of the Regional Vice Presidents of Sales would report to the CSO, Chief Sales Officer. The vice presidents of finance, treasury, and investor relations report to the CFO. When smaller companies assign C-level titles, they use them more to grant prestige than out of functional necessity. In such cases, people with lower-level management titles report directly to a C-level executive. For example, a CFO’s direct reports in a small company might include the accounting manager and the payroll supervisor. The top executive in an organization can have many titles. These include owner, founder, or manager. The title could also be managing partner or president. In the largest organizations, and more frequently in smaller ones, the title of president has been replaced by CEO, Chief Executive Officer. Many titles exist for individuals in senior management jobs. If you have a career goal to earn one of these titles, remember that they are easier to lose than to attain. People work very hard to get their senior management job title, and even harder to keep it, by producing real and consistent results.